Automate Google Chrome using native AutoHotkey. Chrome offers a WebSocket based API they call the Chrome DevTools Protocol. This API is what allows web development tools to build integrations, and tools such as Selenium to perform their automation. The protocol's documentation describes a plethora of exciting endpoints accessible using this library, and can be found at the link below. 1. ProfilePath - This is the path, relative to the working directory, that your Chrome user profile is located. If an empty folder is given, chrome will generate a new user profile in it. When this parameter is omitted, Chrome will be launched under the default user profile. However, if chrome is already running under that user profile out of debug mode, this will fail. Because of this, it is recommended to always launch Chrome under an alternate user profile. 2. URL - The page that chrome should initially be opened to. Pass an empty string to open Chrome's homepage. When this parameter is omitted, Chrome will be opened to about:blank. 3. ChromePath - The path to find the Chrome executable file. When this parameter is omitted, Chrome will be launched from the path in its start menu entry. 4. DebugPort - The network port to communicate with Chrome over. When this parameter is omitted, port 9222 will be used as specified in the Chrome DevTools Protocol documentation. You can find more sample code showing how to use this library in the Examples folder. Btw... I also like your CodeQuicktester a lot and use it everyday. I'm very excited to play with this! Thanks GeekDude! 1) I just got my first one to launch! 2) When I downloaded the various zipped files from GitHub, the two subfolders (AutoHotkey-JSON and WebSocket.ahk) were empty. Thanks again for your work on this! It can definitely open an amazing amount of opportunities for AutoHotkey! 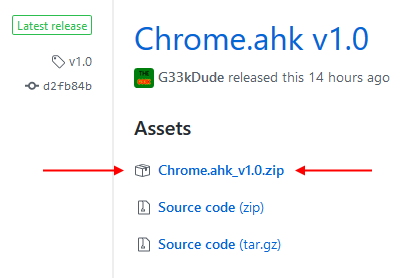 Make sure you're downloading the release file "Chrome.ahk_v1.0.zip" from the releases page, not the source code. As you have learned, GitHub does not include submodules (i.e. AutoHotkey-JSON and WebSocket.ahk) in its source downloads. The release has all the #Include's built in (no lib folder needed ). What did the security error dialog say? If it was a problem that prevented the websocket form connecting, it would make sense that it would get stuck waiting for the connection to complete. Ah, hm. This script works by creating a hidden web control (IE) and using Microsoft's WebSocket object through COM. It then uses this WebSocket to connect to Chrome. On my system, IE is forbidden from accessing localhost, but is allowed to access 127.0.0.1. It looks like your system is blocking 127.0.0.1 too, for some reason. You can disable this block (not sure how this effects general security of IE) by following the steps in this StackOverflow post. From my testing, only that top checkbox (intranet) needed to be unchecked to allow access (to localhost), but it may be different for you. I'm not sure how this change would effect security, so I would only do this for testing purposes. What version of Windows and Internet Explorer do you have, and are you on a corporate network? If you are, what kind of proxy settings are set in IE? As far as I have been able to there really is no real way to turn a non-debug chrome instance to a debug instance without first closing out all windows under that profile. As a workaround, you could change the shortcut you open Chrome with to include the debug flag so that you'll always be opening in debug mode . I'm not sure what kind of security risks that would open you up to. If Chrome allows non-localhost connections (I think it might) and is allowed through the firewall (probably is) anyone else on the network could sneak into your session without you knowing. I'd need to do some more testing before I can recommend this in good conscience. @GeekDudeBecause I already had a shortcut to launch Chrome in debug mode for Selenium (so I could connect to it as tmplinshi did here. Perhaps I need to control for the profile? Thanks GeekDude! I'd tried that however I'd failed to close-out the background /default version of Chrome that stays running. After closing that version out, it was able to connect! I'll work on cleaning up the examples I've created and will share tomorrow/soon. Thanks again for working on this! It opens up a ton of possibilities! GeekDude wrote: Ah, hm. This script works by creating a hidden web control (IE) and using Microsoft's WebSocket object through COM. It then uses this WebSocket to connect to Chrome. On my system, IE is forbidden from accessing localhost, but is allowed to access 127.0.0.1. It looks like your system is blocking 127.0.0.1 too, for some reason. Sorry for late reply, and thanks for your help, unchecking the second checkbox "Include all sites that bypass the proxy server" works for me. I am using Windows 10 x64 with IE 11, on a normal network. The IE browser was set with PAC proxy, which is used by Shadowsocks.